For those of us in the East Coast, winter is when we really need a slice of that happy-go-lucky "Aloha Spirit." It's when we spend hours scrolling through beach photos on Instagram and daydreaming about quitting everything and moving somewhere tropical to scoop ice cream. But this year, we're getting in on the #islandlife with gifts for friends and family curated by one of the best shops in Honolulu. 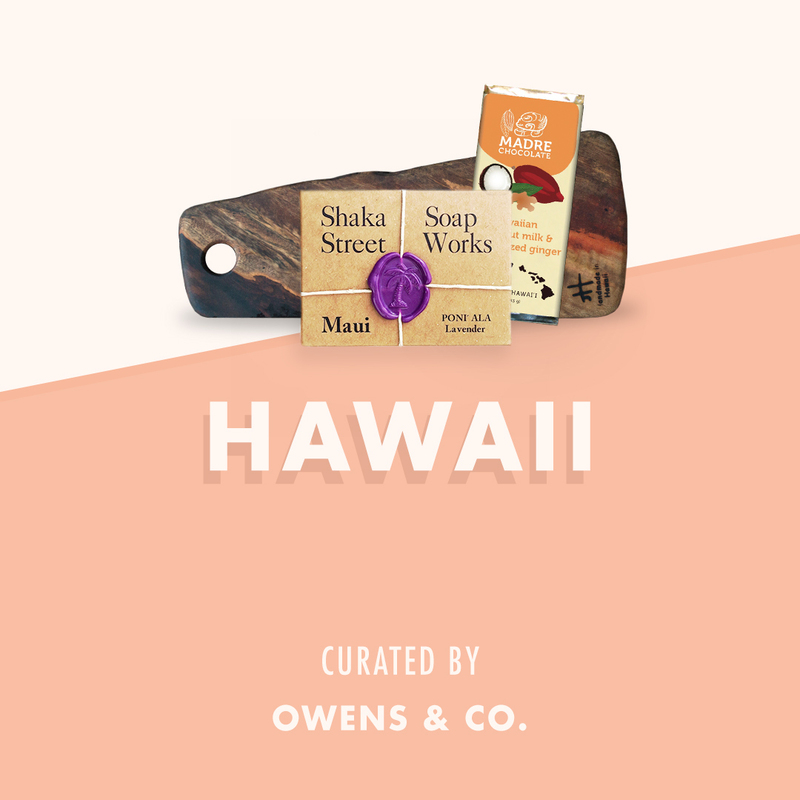 Packed with a well-chosen assortment of cheery lifestyle goods made locally and beyond, Owens & Co. captures that irresistible laid-back attitude Hawaii is known for. 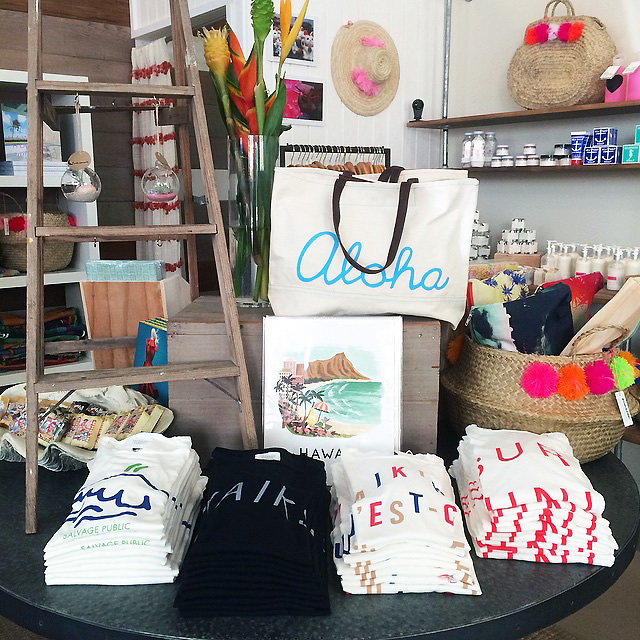 Owner Marie Owens suggests these pick-me-up goods courtesy of the Aloha state. "If you want give a gift that will make someone smile, check out Jana Lam's vibrant island-inspired accessories. All of her one-of-a-kind designs are hand-sketched, hand-screened, and hand-sewn in her seaside studio. I love the Mini Mini clutch as it holds the essentials and makes an eye-catching statement." "This is a my go-to necklace that I wear almost everyday. 'Aloha' is Hawaii's timeless sentiment, and it will never go out of style." "Soap maker Lisa Lareau creates this gorgeous small-batch soap in her Maui studio. My favorite scent is lavender. It's divinely calming, refreshing, and made with Maui-grown lavender." "Jen Homcy creates the most beautiful and functional works of art for the home in her North Shore studio. Each of her boards are made from recycled, locally sourced hardwoods. Each board is one-of-a-kind, shaped by hand, and made with lots of love." "Nick Kuchar's interpretation of retro-Hawaiian, surf-inspired graphics is unparalleled. His prints are insanely colorful, nostalgic, and oh-so-much fun!" "'Ili coffee scrubs are the ultimate island treat for your skin! Kauai-based Aimee Campbell concocts her body scrubs with coffee, Hawaiian sea salt, organic sugar and coconut oil. They leave your skin feeling refreshed and invigorated." "Ian and Stacey Nomura create timeless and charming Hawaiian-style paper goods that they make and sell at their Oahu studio/boutique, South Shore Paperie. The Shave Ice Mini Notebooks are absolutely adorable and irresistible, just like their frosty namesake." "My friend Merlin Edmonds is the Kauai-based artist behind these gorgeous tea towels. All of Cultivate Hawaii's designs incorporate Hawaii's beauty and culture, and are inspired by Merlin's work as a botanist and conservationist." "This is my favorite flavor from our next-door neighbors, Madre Chocolate. Madre Chocolate processes all of its small-batch chocolate here on Oahu. This bar is absolutely heavenly and made from Hawaii-grown beans harvested on the Big Island." "Andrew Mau is one of my absolute favorite local designers. He interprets his modern, island-inspired designs in the form of furniture, stationery, jewelry, clothing, and accessories. This shaka bottle opener is the essential 'Pau Hana' gadget. ('Pau Hana' means 'Done or finished with work,' which means it's time to 'talk story' over beers or cocktails!)"